Steamboats on Moosehead Lake opened the great Maine woods for those who came to harvest the timber, for those who traveled to fish and hunt, and for those who sought the beauty of forest, mountains and clean waters. This is the story of those boats and the enterprise they made possible. 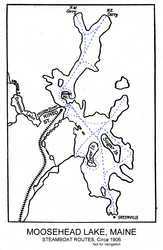 The Native Americans called Moosehead Lake K-ci-Sebem, the great collection of the waters. For forty miles, it reaches between the mountains and into the great Maine woods. At the lake's widest point, the curvature of the earth keeps one from seeing the actual shoreline across the water. Thirty-five million cubic feet of water can be drawn off from the dams at the two outlets. Two hundred and thirty feet at its deepest, Moosehead is an incredible collection of the waters. From the time that human beings arrived in central Maine, Moosehead has been a great thoroughfare into the wilderness. From it, the Kennebec River flows south. Into it, Moose River flows in from the west and Roach River from the east. At its northernmost point, it is only a few rods more than two miles to the West Branch of the Penobscot and perhaps fourteen miles to the headwater of the Saint John River. By river, a series of short carries and a chain of large lakes, the route lies open from Moosehead to the Allagash. The versatile vehicle became the canoe. First to use the waterways to and from Moosehead were the Native Americans. As early as the 1640s the black-robed fathers from Quebec and explorers and mapmakers like Montressor (ca. 1761) visited the lake. The first vessels to join the canoes were sailboats, sloops, and two-masted schooners. The larger boats were busy freighting men and supplies to logging operations while sports, who came early to the lake to fish, were advised to hire one of the smaller sloops. As the nineteenth century got underway the exciting advance was the steamboat. What was needed on Moosehead Lake were boats that could tow large rafts of logs and that could keep schedules despite rough weather. In 1836, a logger, dam builder, and river driver by the name of Hogan built the first steamboat on the Lake. No picture of this boat has survived. She seems to have been named the Moosehead (thus making her the Moosehead I) and to have been 96 feet long with a 40-horsepower, low-pressure steam engine. In the early 1840s Major Benjamin Bigney arrived in Greenville from Pugwash, Nova Scotia. He married Lydia Scammon, daughter of an early settler, and settled down to build steamboats. In 1846, he built the Amphitrite, a side-wheeler named after the wife of the sea god Poseidon. Unlike the Bigney boats to follow, this was not a handsome vessel. Thoreau, in 1854, thought that her name was as "trite" as the ships hull. Fairy of the Lake was typical of the large side-wheelers that were to ply the lake for years. Built by Bigney in 1853-4, the Fairy was 140 feet long with a beam of 23 feet. Reportedly she had a crosshead engine that had been used in a New York Harbor towboat and for a while on Sebago Lake. In our picture the Fairy is shown along side the smaller Rebecca at East Cove in Greenville. Both boats were owned by local entrepreneur John Eveleth. Governor Coburn was another Bigney built boat (1872). She was powered by a Paine, steeple-type engine, and there was stained glass in the housing around her walking-beams. Although she towed booms and hauled freight for the Coburn Steamboat Co., she had special amenities for passengers and the summer trade. For 23 years she had a busy life on the lake. Our two stereoscope cards show the Coburn docked in front of the Lake House Hotel in Greenville, and her salon with its marble top tables. As the nineteenth century matured, improvements in steam engines and propulsion continually appeared on Moosehead Lake. Propellers appeared first on the smaller steamboats but became standard on the second generation of larger steamers. The Katahdin I (1896-1913) was a twin-screw boat, 111 feet long and with a six-foot draft. A double expansion engine provided power, efficiency, and speed. A man could stand in the Katahdin's low-pressure cylinder. While most of the Moosehead steamboats were built on the shore of the lake, there were notable exceptions. The Twilight I was built in Bath, brought by rail to Lowe's Bridge, located south of Guilford and at that time the railhead for the Bangor and Piscataquis Railroad. From there fifty pair of oxen did the often up-hill hauling to Greenville. The steel hull of the Katahdin II was also built in Bath and moved in three sections by railroad to Greenville Junction. Until the coming of the railroad to Greenville Junction in 1884, steamboats on Moosehead Lake were fueled with wood. One stop for wood was the lakeside Ronco Farm that furnished 600 cords of hardwood a year. With the coming of the railroad, coal became the fuel of choice and was loaded onto the steamers at Greenville Junction by wheelbarrow. Our two photos show the steamer Ripple taking on wood for her boiler, and Everett Parson and team just having delivered a load of mill slabs to the pile of wood fuel beside The Fairy of the Lake. In the 1920s the steam plants and engines were replaced by oil burning internal combustion engines.